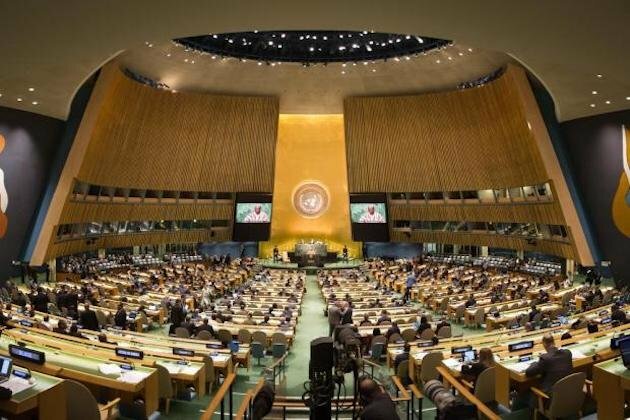 NEW YORK, New York The UN General Assembly on Friday adopted 36 resolutions and four decisions, relating to a variety of issues including the Israeli-Palestinian conflict,decolonization, atomic energy and Outer Space. On Israel-Palestine issues, the Assembly adopted 9 resolutions, all by recorded vote. Among them was the text Operations of the United Nations Relief and Works Agency for Palestine Refugees in the Near East which it adopted by a recorded 159 votes in favour to 5 against, with twelve absentions. Countries to vote against the resolution were Israel, the United States the Marshall Islands, Microneia and Canada. By the terms of the text, the Assembly expressed deep concern over the critical financial situation of the United Nations Relief and Works Agency for Palestine Refugees in the Near East (UNRWA), caused by structural underfunding as well as rising needs and expenditures resulting from deteriorating socioeconomic and humanitarian conditions. It also expressed concern over attempts to discredit the Agency despite its proven operational capacity, record of effectively providing humanitarian and development assistance, and consistent implementation of its mandate. The Assembly also adopted the resolution Work of the Special Committee to Investigate Israeli Practices Affecting the Human Rights of the Palestinian People and Other Arabs of the Occupied Territories, by a recorded vote of 78 in favour to 10 against (Australia, Canada, Guatemala, Honduras, Israel, Marshall Islands, Federated States of Micronesia, Nauru, Solomon Islands, United States voted against the resolution), with 84 abstentions. By that text, the Assembly requested that the Special Committee continue investigating Israeli policies and practices in the Occupied Palestinian Territory, especially violations of the Geneva Convention, as well as the treatment and status of thousands of prisoners and detainees, including children, women and elected representatives, inside Israeli prisons and detention centres within the Occupied Palestinian Territory. On decolonization questions, the Assembly adopted 21 resolutions and one decision. Among the resolutions was the text Implementation of the Declaration on the Granting of Independence to Colonial Countries and Peoples, adopted by a recorded vote of 124 in favour to 8 against (Cte dIvoire, Gabon, Israel, Morocco, Senegal, South Sudan, United Kingdom, United States voted against), with 46 abstentions. According to its terms, the Assembly requested that the Special Committee continue to dispatch visiting and special missions to the Territories, in accordance with the relevant resolutions. It called upon administering Powers to ensure that their economic and other activities in the Territories do not adversely affect the interests of their peoples, but instead promote development. It also called upon administering Powers to terminate their military activities and eliminate their military bases in the Territories. Also adopted by a recorded vote was a text on dissemination of information on decolonization, which the Assembly passed by 172 votes in favour to 3 against (Israel, United Kingdom, United States voting against), with 3 abstentions (France, Malawi, Togo). By its terms, the Assembly stressed the importance of visiting missions of the Special Committee on Decolonization in contributing to the dissemination of decolonization information. In that regard, the Assembly requested that the Department of Public Information actively engage and seek new and innovative ways to disseminate materials to the Non-Self-Governing Territories. It also requested that the Departments of Political Affairs and Public Information implement the Special Committees recommendations and continue their efforts to publicize the Organizations decolonization efforts. In other recorded votes, the Assembly adopted texts on assistance to Palestine refugees; persons displaced as a result of the June 1967 and subsequent hostilities; Palestine refugees properties and their revenues; Israeli settlements in the Occupied Palestinian Territory, including East Jerusalem and the occupied Syrian Golan; Israeli practices affecting the human rights of the Palestinian people in the Occupied Palestinian Territory, including East Jerusalem; and the occupied Syrian Golan. It also adopted a text on the applicability of the Geneva Convention relative to the protection of civilian persons in time of war, of 12 August 1949, to the Occupied Palestinian Territory, including East Jerusalem, and other occupied Arab territories. The Assembly went on to adopt, also by recorded vote, draft resolutions on information from Non-Self-Governing Territories transmitted under Article 73(e) of the United Nations Charter; economic and other activities affecting the interests of the peoples of the Non-Self-Governing Territories; dissemination of information on decolonization; and implementation of the Declaration on the Granting of Independence to Colonial Countries and Peoples. Closely following the Fourth Committees recommendations, the Assembly also adopted, without a vote, a series of annual drafts relating to the decolonization of specific Non-Self-Governing Territories. They included texts affirming the right to self-determination for the peoples of Western Sahara, American Samoa, Anguilla, Bermuda, British Virgin Islands, Cayman Islands, French Polynesia, Montserrat, New Caledonia, Pitcairn, Saint Helena, Tokelau, Turks and Caicos Islands, and the United States Virgin Islands. Also without a vote, the Assembly adopted texts relating to the University for Peace, the effects of atomic radiation, peaceful uses of outer space, special political missions, questions of information and offers by Member States of study and training facilities for inhabitants of Non-Self-Governing Territories. It took note of a report on the comprehensive review of the whole question of peacekeeping operations in all their aspects, without taking action. Acting without a vote, the Assembly adopted decisions relating to the question of Gibraltar and the proposed programme of its own work for the seventy-fourth session. Presenting reports for the Assemblys consideration was the Rapporteur of the Fourth Committee. Cubas representative delivered a statement in explanation of position. LUIS MAURICIO ARANCIBIA FERNNDEZ (Bolivia), Rapporteur of the Fourth Committee, introduced that bodys reports, saying they contain 36 draft resolutions and 4 draft decisions negotiated over the course of 28 formal meetings. The Committee was able to fulfil the mandate entrusted to it by the General Assembly, he added, recalling the high level of cooperation prevailing during its meetings. The General Assembly met on Friday morning to take action on draft resolutions and decisions contained in reports of its Fourth Committee (Special Political and Decolonization) on the following agenda items: University for Peace (documentA/73/470); effects of atomic radiation (documentA/73/521); international cooperation in the peaceful uses of outer space (documentA/73/471); United Nations Relief and Works Agency for Palestine Refugees in the Near East (documentA/73/523); report of the Special Committee to Investigate Israeli Practices Affecting the Human Rights of the Palestinian People and Other Arabs of the Occupied Territories (documentA/73/524); comprehensive review of the whole question of peacekeeping operations in all their aspects (documentA/73/525); and comprehensive review of special political missions (documentA/73/526). Also awaiting action were the Committees reports on: questions relating to information (documentA/73/472); information from Non-Self-Governing Territories transmitted under Article 73 e of the Charter of the United Nations (documentA/73/473); economic and other activities which affect the interests of the peoples of the Non-Self-Governing Territories (documentA/73/474); implementation of the Declaration on the Granting of Independence to Colonial Countries and Peoples by the specialized agencies and international institutions associated with the United Nations (documentA/73/475); offers by Member States of study and training facilities for inhabitants of Non-Self-Governing Territories (documentA/73/476); implementation of the Declaration on the Granting of Independence to Colonial Countries and Peoples (documentA/73/532); and revitalization of the work of the General Assembly (document A/73/533); and programme planning (documentA/73/534). The Assembly began by adopting a draft resolution concerning the University for Peace (document A/C.4/73/L.7), by which it requests that the institution find viable ways to further strengthen cooperation with the United Nations system. It also requests that Member States make financial contributions that will enable the University to offer its study programmes to all students wishing to participate, and by facilitating the institutions operations in host countries. Taking up a draft resolution on the effects of atomic radiation, the Assembly retained operative paragraph 21 (e) of the text, deciding to accept observer delegations as States members of the United Nations Scientific Committee on the Effects of Atomic Radiation in their fourth year, with due consideration for a fair degree of participation in accordance with the SecretaryGenerals suggested framework of membership criteria and indicators. The Assembly retained that paragraph by a recorded vote of 162 in favour to 2 against (Israel, United States), with 1 abstention (Sudan). By the terms of the resolution as a whole (document A/C.4/73/L.9), adopted without a vote, the General Assembly supports the Scientific Committees intentions and plans for the conduct of its programme of work, in particular its next periodic global surveys of exposure to radiation. The Assembly requests that the United Nations Environment Programme (UNEP) continue, within existing resources, to service the Scientific Committee, insisting that UNEP take all steps to ensure continuity. It also requests that any ongoing selection process for a new Secretary of the Scientific Committee be expedited and managed in a transparent manner. Turning to outer space affairs, the Assembly then adopted, without a vote, the draft resolution International cooperation in the peaceful uses of outer space (document A/C.4/73/L.4). By that text, the General Assembly recommends that States which have not yet become parties to the international treaties governing the uses of outer space ratify or accede to those instruments and incorporate them into national legislation. By further terms, the Assembly urges all States, in particular those with major space capabilities, to help prevent an arms race in outer space. Also adopted without a vote was the draft decision Increase in the membership of the Committee on the Peaceful Uses of Outer Space (document A/C.4/73/L.6). By that text, the Assembly takes note of applications by Cyprus, Ethiopia, Finland, Mauritius and Paraguay for membership in that Committee, and in that context, decides to appoint them as members. The General Assembly then took up four draft resolutions relating to Palestine refugees. By a recorded 163 votes in favour to 2 against (Israel, United States), with 13 abstentions it adopted the draft resolution Assistance to Palestine refugees (document A/C.4/73/L.14), expressing concern over the severe financial crisis confronting the United Nations Relief and Works Agency for Palestine Refugees in the Near East (UNRWA) and its negative implications for continued delivery of its core programmes. The Assembly also expresses grave concern about the difficult situation of Palestine refugees under occupation, underlining the importance of assistance and urgent reconstruction efforts. It calls upon all donors to continue strengthening their efforts to meet the Agencys anticipated needs. By a recorded vote of 155 in favour to 6 against (Canada, Israel, Marshall Islands, Federated States of Micronesia, Nauru, United States), with 13 abstentions, the Assembly then adopted the draft Persons displaced as a result of the June 1967 and subsequent hostilities (document A/C.4/73/L.15). By its terms, the Assembly reaffirms the right of all persons displaced because of the June 1967 and subsequent hostilities to return to their homes or former places of residence. It further stresses the need for the accelerated return of those displaced, strongly appealing to all Governments, organizations and individuals to contribute generously to UNRWA and others in that regard. The Assembly went on to adopt the draft Operations of the United Nations Relief and Works Agency for Palestine Refugees in the Near East (A/C.4/73/L.16) by a recorded vote of 159 in favour to 5 against (Canada, Israel, Marshall Islands, Federated States of Micronesia, United States), with 12 abstentions. It expresses deep concern about UNRWAs critical financial situation, caused by structural underfunding as well as rising needs and expenditures resulting from deteriorating socioeconomic and humanitarian conditions. It also expresses grave concern over attempts to discredit the Agency despite its proven operational capacity, record of effectively providing humanitarian and development assistance, and the consistent implementation of its mandate. By other terms, the Assembly urges the Government of Israel to reimburse UNRWA for all transit charges it incurred and other financial losses it sustained as a result of delays as well as restrictions on movement and access imposed by that country. By a recorded 156 votes in favour to 6 against (Canada, Israel, Marshall Islands, Federated States of Micronesia, Nauru, United States), with 14 abstentions, the Assembly went on to adopt the draft Palestine refugees properties and their revenues (documentA/C.4/73/L.17), requesting that the SecretaryGeneral take all appropriate steps to protect Arab property, assets and property rights within Israel. Further, it calls upon Israel to render all facilities and assistance to the Secretary-General in implementation of the draft resolution, and upon all parties concerned to provide the Secretary-General with any pertinent information concerning such property inside Israel. The General Assembly then took up five draft resolutions relating to Israels illegal practices in occupied Palestinian and other Arab territories. It adopted the draft Work of the Special Committee to Investigate Israeli Practices Affecting the Human Rights of the Palestinian People and Other Arabs of the Occupied Territories (document A/C.4/73/L.18) by a recorded vote of 78 in favour to 10 against (Australia, Canada, Guatemala, Honduras, Israel, Marshall Islands, Federated States of Micronesia, Nauru, Solomon Islands, United States), with 84 abstentions. By that text, the General Assembly demands that Israel cooperate, in accordance with its obligations as a State Member of the United Nations, with the Special Committee in implementation of its mandate. It further requests that the Special Committee continue investigating Israeli policies and practices in the Occupied Palestinian Territory, especially violations of the Geneva Convention, as well as the treatment and status of thousands of prisoners and detainees including children, women and elected representatives inside Israeli prisons and detention centres within the Occupied Palestinian Territory. The Assembly went on to adopt by a recorded vote of 158 in favour to 6 against (Canada, Israel, Marshall Islands, Federated States of Micronesia, Nauru, United States), with 14 abstentions the draft Applicability of the Geneva Convention relative to the Protection of Civilian Persons in Time of War, of 12 August 1949, to the Occupied Palestinian Territory, including East Jerusalem, and the other occupied Arab territories (document A/C.4/73/L.19). By that text, the General Assembly demands that Israel accept the de jure applicability of the Convention in the Occupied Palestinian Territory, including East Jerusalem, and other Arab territories it has occupied since 1967, and that it comply scrupulously with the provisions of the Convention. The Assembly also calls upon all High Contracting Parties to the Convention to continue to exert all efforts to ensure Israels respect for its provisions in the Occupied Palestinian Territory. The Assembly then adopted the draft Israeli settlements in the Occupied Palestinian Territory, including East Jerusalem, and the occupied Syrian Golan (document A/C.4/73/L.20) by a recorded 154 votes in favour to 6 against (Canada, Israel, Marshall Islands, Federated States of Micronesia, Nauru, United States), with 15 abstentions. By its terms, the General Assembly condemns acts of violence, destruction, harassment, provocation and incitement by Israeli settlers in the Occupied Palestinian Territory. It also calls for accountability in relation to the illegal actions perpetrated by Israeli settlers in the Occupied Palestinian Territory. Taking up the draft Israeli practices affecting the human rights of the Palestinian people in the Occupied Palestinian Territory, including East Jerusalem (document A/C.4/73/L.21), the Assembly adopted it by a recorded vote of 152 in favour to 8 against (Australia, Canada, Israel, Marshall Islands, Federated States of Micronesia, Nauru, Solomon Islands, United States), with 13 abstentions. By its terms, the General Assembly demands that Israel cease all measures contrary to international law, as well as discriminatory legislation, policies and actions in the Occupied Palestinian Territory. It also demands that Israel cease all its settlement activities, construction of the wall and any other measures aimed at altering the character, status and demographic composition of the Occupied Palestinian Territory. Further, the Assembly demands that Israel comply with its obligations under international law and cease its imposition of prolonged closures and economic and movement restrictions, including those amounting to a blockade of the Gaza Strip. The Assembly also adopted by a recorded vote of 149 in favour to 2 against (Israel, United States), with 22 abstentions, the draft The occupied Syrian Golan (document A/C.4/73/L.22). By that text, the Assembly calls upon Israel to desist from changing the physical character, demographic composition, institutional structure and legal status of the occupied Syrian Golan, and, in particular, to desist from establishing settlements there. It also calls upon Israel to desist from imposing Israeli citizenship and identity cards on Syrian citizens in the occupied Golan. Next, the General Assembly took note of the report Comprehensive review of the whole question of peacekeeping operations in all their aspects (documentA/73/525), taking no action. It then adopted, without a vote, a draft resolution relating to special political missions (document A/C.4/73/L.8), by which it stresses the need for the United Nations to continue to improve its capabilities in the pacific settlement of disputes, including mediation, conflict prevention, conflict resolution, peacebuilding and sustaining peace, for the maintenance of international peace and security. By other terms, the Assembly stresses the need for enhanced coordination and cooperation between special political missions and regional and subregional organizations. It further requests that the SecretaryGeneral hold regular, inclusive and interactive dialogue on overall policy matters pertaining to special political missions, and reach out to Member States before holding such dialogue in order to ensure participation. Turning to questions relating to information, the Assembly adopted two draft resolutions without a vote. It first adopted draft resolution A, Information in the service of humanity, contained in the report on the fortieth session of the Committee on Information (documentA/73/21). By its terms, the General Assembly urges all countries and organizations concerned to ensure the free and effective performance of journalists professional tasks and condemns resolutely all attacks against them. By other terms, the Assembly further urges States and organizations to enhance regional efforts and cooperation among developing countries, as well as cooperation between developed and developing countries, to strengthen communications capacities and improve media infrastructure, especially in the areas of training and dissemination of information. Acting again without a vote, the Assembly adopted draft resolution B, United Nations public information policies and activities, contained in the same report (document A/73/21). By that text, the Assembly underlines that reform of the Department of Public Information should consider the priorities set out by the Committee on Information and the importance of carrying out appropriate consultations with Member States. Further, it emphasizes that the Department should maintain and improve its activities in the areas of special interest to developing countries where its activities should contribute to bridging the existing gap between developing and developed countries in the crucial field of public information and communications. By the terms of one operative paragraph, the Assembly encourages the Department to engage in a comprehensive promotional campaign in preparation for the next Conference of the Parties to the United Nations Framework Convention on Climate Change to be held in Katowice, Poland, from 2 to 14 December 2018 and the Intergovernmental Conference to Adopt the Global Compact for Safe, Orderly and Regular Migration, to be held in Marrakech, Morocco, on 10 and 11 December 2018. Further by that text, the Assembly underlines the importance of the Departments integration of multilingualism into the planning and implementation of promotional campaigns. It also encourages the Department to develop partnerships with the private sector and relevant organizations that promote the official United Nations languages in order to promote the Organizations activities in a cost-neutral manner. By other terms, the Assembly notes with concern that the multilingual development and enrichment of the United Nations website in certain official languages has improved at a much slower rate than expected and urges the Department to advance actions to achieve full parity among the six official languages on the website. The Assembly then took up several texts on decolonization. First, it adopted by a recorded vote of 178 in favour to 2 against (Israel, United States), with 3 abstentions (United Kingdom, France, Liberia) a draft resolution on information from Non-Self-Governing Territories transmitted under Article 73 e of the Charter of the United Nations (document A/73/23, chapter XIII, p.41). By its terms , the General Assembly requests that the administering Powers transmit or continue to transmit regularly to the SecretaryGeneral, statistical and other information of a technical nature relating to the economic, social and educational conditions in the Territories for which they are respectively responsible. In another recorded vote, the Assembly adopted a draft resolution on economic and other activities which affect the interests of the peoples of the Non-Self-Governing Territories (document A/73/23, chapter XIII, p.41), by a recorded 175 votes in favour to 2 against (Israel, United States), with 3 abstentions (France, Liberia, United Kingdom). By that text, the General Assembly expresses deep concern over the number and scale of natural disasters and their devastating impact on the Non-Self-Governing Territories in the Caribbean Sea during 2017. It also expresses concern about activities aimed at exploiting the natural and human resources of Non-Self-Governing Territories to the detriment of their inhabitants. The Assembly then adopted the draft resolution Implementation of the Declaration on the Granting of Independence to Colonial Countries and Peoples (document A/73/23, chapter XIII, p.118) by a recorded vote of 124 in favour to 8 against (Cte dIvoire, Gabon, Israel, Morocco, Senegal, South Sudan, United Kingdom, United States), with 46 abstentions. According to that text, the General Assembly requests that the Special Committee continue to dispatch visiting and special missions to the Territories, in accordance with the relevant resolutions. It calls upon administering Powers to ensure that their economic and other activities in the Territories do not adversely affect the interests of their peoples, but instead promote development. It also calls upon administering Powers to terminate their military activities and eliminate military bases in the Territories. By further terms, the Assembly calls upon administering Powers to ensure that the exploitation of marine and other natural resources in the NonSelfGoverning Territories do not violate the relevant United Nations resolutions or adversely affect the interests of the peoples of those Territories. It also calls on them to provide all necessary assistance to the peoples of the Non-Self-Governing Territories affected by recent hurricanes in order to alleviate humanitarian needs in the affected communities, support recovery and rebuilding efforts, and enhance emergency-preparedness and risk-reduction capabilities. The Assembly then adopted, without a vote, a draft resolution on offers by Member States of study and training facilities for inhabitants of Non-Self-Governing Territories (document A/C.4/73/L.2). Also without a vote, it adopted a draft on Western Sahara (document A/C.4/73/L.3), by which it calls upon all parties concerned as well as States of the region to cooperate fully with the Secretary-General, his Personal Envoy and each other. Acting again without a vote, the Assembly adopted drafts on the following individual NonSelfGoverning Territories: American Samoa, Anguilla, Bermuda, British Virgin Islands, Cayman Islands, French Polynesia, Montserrat, New Caledonia, Pitcairn, Saint Helena, Tokelau, Turks and Caicos Islands and the United States Virgin Islands. The Assembly also adopted, again without a vote, the draft Question of Guam (document A/73/23, page 76), while adopting a proposed amendment (document A/C.4/73/L.11) to that text by a recorded 51 votes in favour to 30 against, with 71 abstentions. It went on to adopt a text on dissemination of information on decolonization (document A/73/23, chapter XIII, p.116) by a recorded vote of 172 in favour to 3 against (Israel, United Kingdom, United States), with 3 abstentions (France, Malawi, Togo). By its terms, the General Assembly stresses the importance of visiting missions of the Special Committee on Decolonization in contributing to the dissemination of decolonization information. In that regard, the Assembly requests that the Department of Public Information actively engage and seek new and innovative ways to disseminate materials to the Non-Self-Governing Territories. It also requests that the Departments of Political Affairs and Public Information implement the Special Committees recommendations and continue their efforts to publicize the Organizations decolonization work. The Assembly went on to adopt by a recorded vote of 126 in favour to 2 against (Israel, United States), with 55 abstentions a draft resolution on implementation of the Declaration on the Granting of Independence to Colonial Countries and Peoples by the specialized agencies and the international institutions associated with the United Nations (document A/73/23, chapter XIII, p.46). By its terms, the Assembly recommends that all States intensify their efforts through specialized agencies and other organizations of the United Nations system to prioritize assistance to the Territories. Further, it requests that the Secretary-General continue to assist those agencies and organizations in working out appropriate measures for implementing relevant United Nations resolutions, and to prepare a report on actions taken in that regard for submission to the relevant entities. The representative of Cuba, speaking in explanation of position regarding the question of Guam, said she joined the consensus because it summarized the work of the Committee in 2018. Noting that the people of Guam still cannot exercise their right to self-determination, she dissociated Cuba from preambular paragraphs 18 and 27 of the text, explaining that they do not reflect the concerns expressed before the Committee by representatives of the Territories regarding the failure of the governing body to respect the Territorys natural resources and the rights of the people. The recent plebiscite removes language on the Chamorro Land Trust programme, thereby circumventing decolonization, she said, describing that action as a regrettable attempt to fracture multilateralism. Taking up a draft decision titled Question of Gibraltar (document A/C.4/73/L.5), the Assembly adopted it without a vote. By its terms, the Assembly urges the Governments of Spain and the United Kingdom to reach a definitive solution to the question of Gibraltar. It also takes note of the United Kingdoms desire to continue with the trilateral Forum for Dialogue, and of Spains position that the Forum does not exist and should be replaced with a new mechanism for local cooperation, in which the people of Campo de Gibraltar and Gibraltar are represented. Finally, the General Assembly adopted the Fourth Committees proposed programme of work for its seventy-fourth session (document A/C.4/73/L.10) without a vote, and took note of the Committees report on programme planning (document A/73/534).